It’s been a hot month. Muggy and oppressive. And the thirteenth of August has rolled around again like a fat repeat customer at the cotton candy booth on the midway. 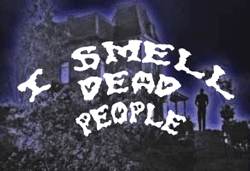 That means it’s time for a new edition of I Smell Dead People, the internet’s most complete compilation of gruesome olfactory discoveries. Fair warning: ISDP is an acquired taste like cocktail olives, cilantro, and hot pickled okra. It’s not for everyone. Maybe you should go visit your FarmVille acreage and count your unicorn herd instead. But if you think you have what it takes, read on. [Pastor Larry] Jones and his wife have been battling an odor emanating from a mausoleum at the Central Grove Cemetery in Albany, Kentucky. Shirley Lovelace, 59, passed away a little over a month ago and was buried in an above ground tomb without being embalmed. Also, according to Jones, she was only placed in a body bag. (. . .) Jones says he has contacted the funeral home, the coroner’s office, and multiple agencies to find a solution to the problem. The funeral home says they followed all rules and regulations and even double checked with the state board before burying Lovelace. A woman’s body was found in Louis Armstrong Park on Basin Street in New Orleans last Thursday morning, when a person walking a dog “noticed a foul smell” and went to investigate. Police believe the body was that of a homeless person. There has been a rash of DBs discovered in cars and trucks this year. This month brings another vehicular incident involving, like several previous ones, a Walmart parking lot. The location is Springfield, Missouri, where “a Walmart shopper noticed an overwhelming foul smell” coming from a red Ford Focus. The deceased was a 45-year-old woman. Police tell KSPR News the woman’s car had the keys in the ignition, but the battery was dead. Officials suspected the car had been running when the battery died. According to officials on the scene, no obvious signs of foul play were detected, however the investigation is ongoing. An autopsy is scheduled for the next week. police removed a decomposing body that was discovered in the trunk of a car in the Trinity Lutheran Church parking lot. Shortly before, someone reported an abandoned vehicle that had a foul odor coming from it. The body is thought to be that of a woman whose family reported her missing a week earlier. Police do not suspect foul play; people living in cars are known to sleep in the trunk and this one was equipped with an emergency latch. Detectives on Monday were investigating the discovery of the body of a 23-year-old man inside a minivan in South Philadelphia. Police were called to 10th and Jackson Streets at 5:23 a.m. Sunday on a report of a foul odor emanating from a green 2000 Mazda MPV minivan. In the backseat, they found a man’s body, wrapped in a blanket. Police are investigating a body found in car in Winter Park. Residents at the Tranquil Terrace Apartments called police after noticing a foul odor near an area of the parking lot. When investigators arrived, they tracked the odor to a car. The death is considered suspicious by local detectives. Another story identifies the deceased as a 29-year-old woman. The Escambia County Sheriff’s Office is investigating a death at a Pensacola Beach residence reported this weekend. At about 11 a.m. Saturday, deputies responded to a report of a foul odor coming from a unit at Starboard Village condominiums on Fort Pickens Road on Pensacola Beach. Inside the condo, deputies found a woman’s body in a state of decomposition. And yet another in Florida, with an odd twist: the body was that of a man who had locked himself inside a shed. Deputies think that after a man got kicked out of a home near West Melbourne, he found shelter in a neighbor’s backyard shed, locked it and died. After noticing a foul smell about 8 p.m. Monday, area residents found human remains behind a home at 48 Paul Rene Drive. CARLSBAD: A person reported a suspected dead body inside a storage unit on Tyler Street because of a foul odor and flies in the area. Police found that was not the case, 7:29 p.m. July 27. CARLSBAD: A woman parked in a Circle K parking lot was loudly playing Alanis Morissette music, disturbing the neighborhood at 2:36 a.m. July 26. She turned down the music after police approached her. A pair of Jehovah’s Witnesses reported a foul odor emanating from that home in the 5800 block of Ardmore Street on Aug. 6. Houston Police and fire department officials arrived to find the bodies around 11 a.m., according to an HPD statement. On reflection, it’s remarkable that Jehovah’s Witnesses don’t discover a lot more such cases. Authorities say they found the decomposing body on Tuesday afternoon after receiving reports from neighbors about a foul odor.